When it comes to Thanksgiving, nothing brings a family together like arts and crafts. Well, there’s the traditional feast and post-dinner football, but beyond that craft time pretty much rules this holiday. Little projects like the making of those hand-print turkeys have become something of a rite of passage for American kids on Thanksgiving –and now that we’re living in the age of Pinterest, the menu of Thanksgiving craft projects you can do with your kids has only gotten more elaborate and extravagant. So if you’re looking for some awesome activities you can do with your children this Turkey Day then today is your lucky day. 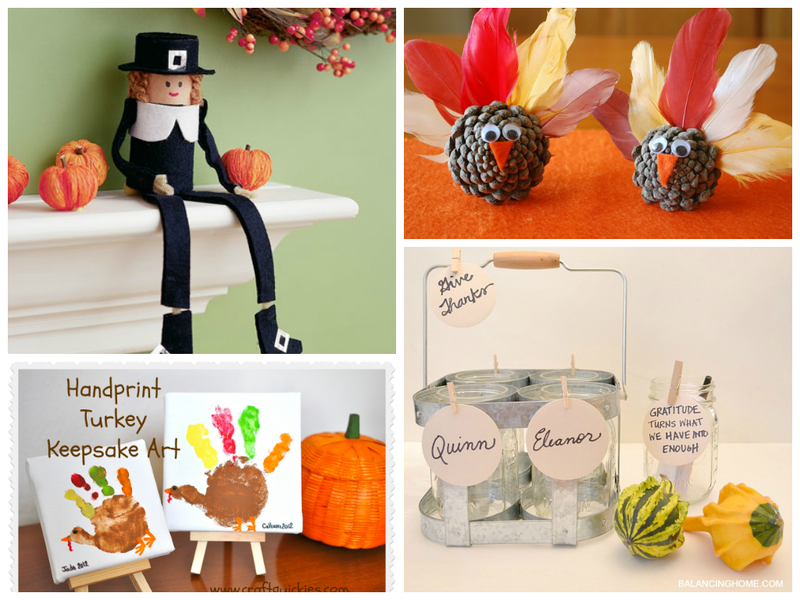 We’ve rounded up our favorite kids projects of the season and compiled them into the ultimate Thanksgiving Arts and Crafts Guide. Read on and enjoy. At the end of the day, Thanksgiving is about one thing – giving thanks for all the blessings life has bestowed upon you. Megan from Balancing Home has come up with a fun project for your kids that will help them keep this tenet in mind. 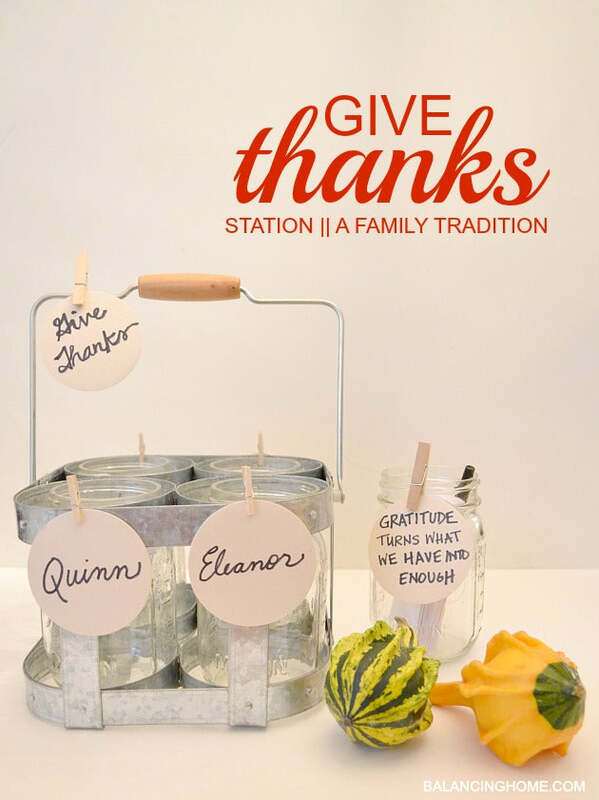 This literal “thanks giving” station is awesomely vintage and easy to make. All you need to do is grab some mason jars, a silverware caddy and a few permanent markers and you’re good to go. Just follow the instructions on Megan’s blog and your family will be stuffing those jars full of blessings in no time. Get it at Balancing Home. So what should you do with all of those decorative pumpkins you’ve got leftover from Halloween? According to Lauren from The Thinking Closet, you should dip them in gold. No, seriously. 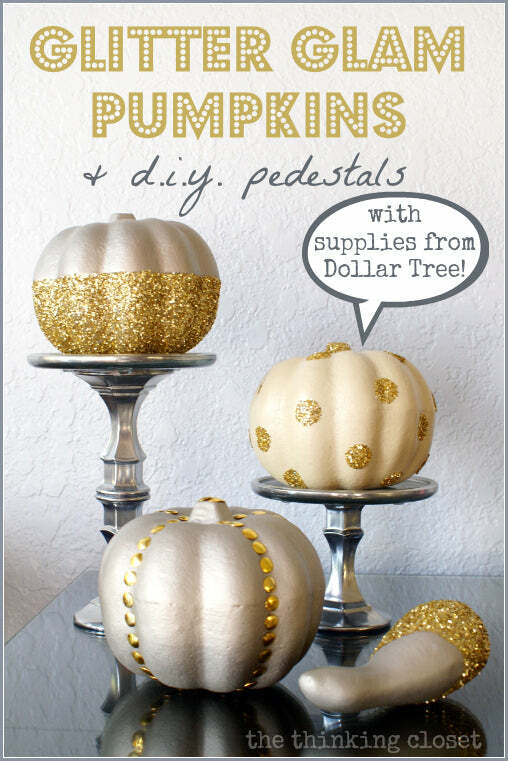 These awesome “Glitter Glam” pumpkins will add a heaping dose of glitz and panache to any Thanksgiving table setting. They’re easy to make and your kids will love them – and the best part is that you can get all the supplies you need from your local dollar store. Get the instructable at The Thinking Closet. Think of the Pilgrim Pal like a Thanksgiving-themed “Elf on the Shelf.” This DIY ragdoll puritan will sit on your mantle and ensure, through his cosmic powers, that you and your family have a wonderful and accident-free Thanksgiving. Your kids will probably need some help with the cutting and sewing for this project, so make you’re your craft closet is stocked with fabric and thread and set aside two to three hours to get everything put together. Get the instructable at Spoonful. 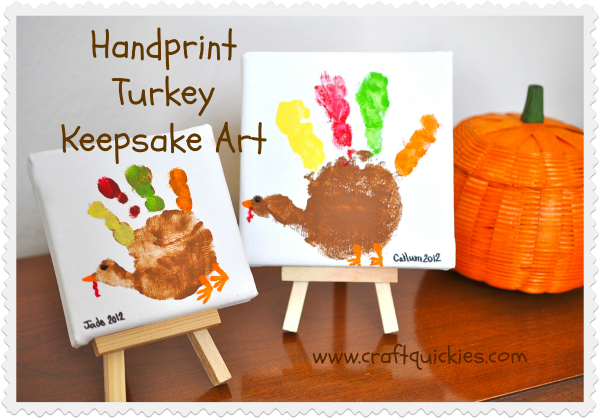 Okay, so handprint turkeys are nothing new. However, this project by Sarah at Bombshell Bling (formerly Craft Quickies) adds a new twist on an old favorite by utilizing mini canvases and easels to make classy little keepsakes that you can display for years to come. You can purchase all of your supplies at a local craft store and the project should only take you around 20 minutes tops – making it perfect for small children and their adorable, limited attention spans. Get the instructable at Bombshell Bling. 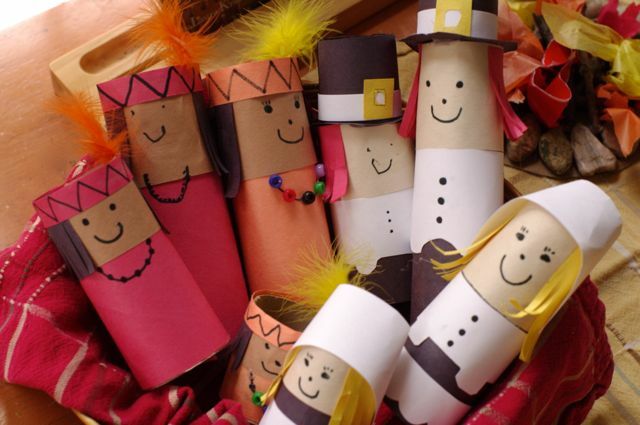 If you’ve got a few cardboard tubes and some construction paper laying around, then you’ve got everything you need to help your kids whip up a nifty Pilgrim and Native American family play set. Making these cylindrical Thanksgiving icons is easy. Just cut the tubes to length, wrap them in construction paper, draw on your faces and add some decorations as a finishing touch. For such a simple project, it’s scary how good the finished product looks. Get the instructable at Creekside Learning. If you were wondering when we would finally include some sort of Thanksgiving dessert project in this roundup, the answer is now. Right now. 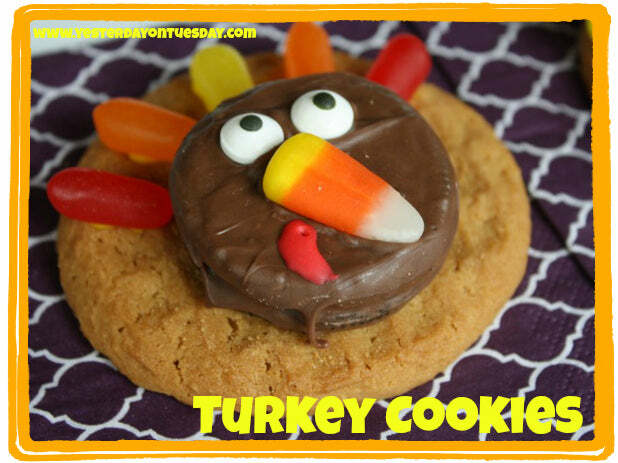 These Turkey cookies by Malia from Yesterday on Tuesday are as adorable as they are delectable and will provide your family with a useful sugar boost after that post-turkey malaise. The best part is that there’s no baking involved – just decorating. That’s something anyone with small children can appreciate. Just grab some Mike and Ikes and some Candy Corn and follow Malia’s instructions on her blog to create your own. Get the instructable at Yesterday on Tuesday. Everybody knows that pinecones are a turkey’s best friend. Actually, we don’t have the science to back that up – but that’s not important here. What’s important is that these Pinecone Turkeys from A Pumpkin and A Princess are super cute and you should get your kids to make them. This project is very kid-friendly. You just need to find a pinecone, stick on some feathers and googley eyes and a felt beak and you’ve got yourself an artsy little turkey. Seriously, you’ve gotta love those googley eyes. Get the instructable at A Pumpkin and a Princess. Multicolored maize has been a staple Thanksgiving decoration for years. While your kids might not like the corn itself, they’ll certainly love these maize-inspired treat bags from Amanda’s Parties TO GO. Amanda has provided all the free printables you’ll need to make these treat bags, so the only supplies you have to gather on your own are some raffia, some bags and of course, the multicolored candy you’ll use as filling. She used Skittles, but Sixlets would also work just fine. Get the instructable at Amanda’s Parties TO GO. Speaking from experience, any sort of project that will help keep your kids organized this Thanksgiving is a blessing. As it so happens, these Pilgrim Hat Crayon Holders from Cupcakes and Crinoline happen to do just that. Armed with a decorative receptacle for their crayons and colored pencils, your kids should be able to tackle every other project on this list without turning your craft room into a calamity of colored wax. And since the project was thought up by Mary Beth’s young son you know it will be a hit with your little ones. Get the instructable at Cupcakes and Crinoline. Share Your Awesome Thanksgiving Kids Projects! 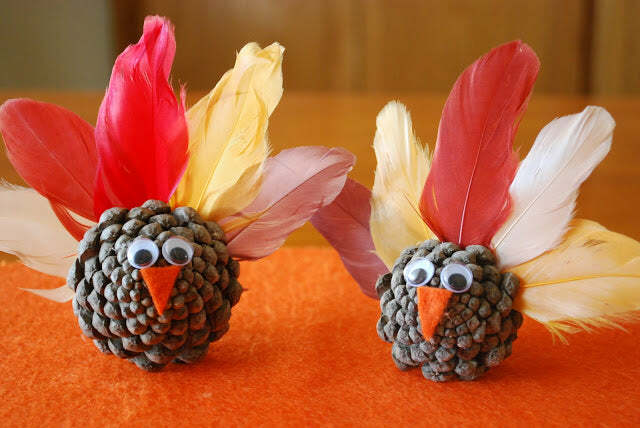 Think you’ve got a crafty kids project for Turkey Day that can trump these awesome ideas? Then put your stuffing where your mouth is. Post your project suggestions in the comments below, and if they’re as great as you say they are we might just feature them here on the ACS blog! Thanks for sharing this Thanksgiving Art. Thanksgiving Scenes Influences Art for sure. 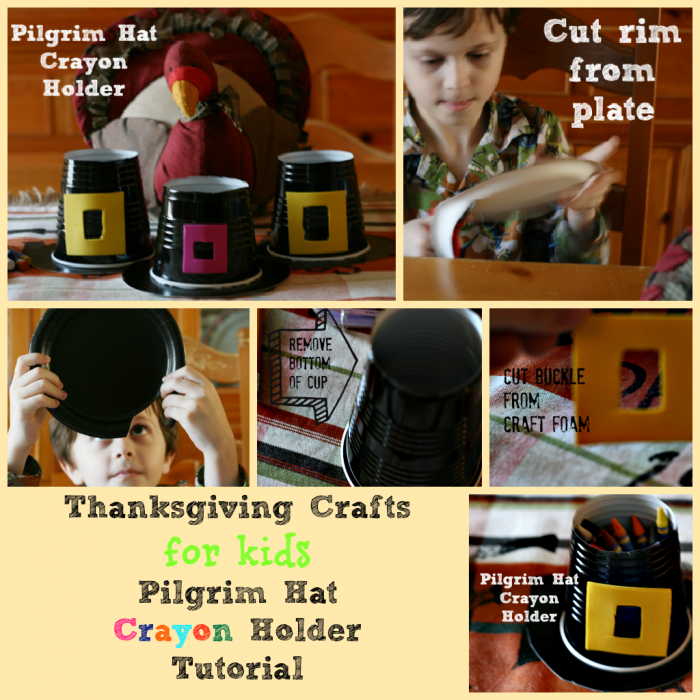 Thank you so much for featuring my Pilgrim Hat Crayon Holder Tutorial ~ I appreciate it! Absolutely! It was a totally cool project that we were happy to post here!